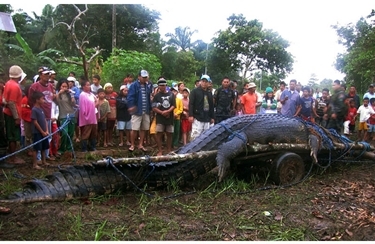 Captured 21′ (6.4 m.) saltwater crocodile. The crocodile is suspected of the killing of a 12-year-old girl in 2009 and of a farmer who went missing in July 2011. Villagers in Bunawan, Philippines last month successfully captured what is believed to be the largest crocodile ever taken alive. The monster is 21 feet (6.4 m.) long, and weighed in at over a ton (2365 lbs. — 1065 kg.). It took more than one hundred men to lift the giant reptile out of the swamp where he was trapped and to get him onto a truck. The villagers named the crocodile “Lolong” and plan to exhibit him to tourists in a new park built for the purpose. Lolong will be the largest reptile in captivity in the world, so he will probably attract plenty of visitors. It took about a month, but Lolong resumed eating early in October. the Archives of Never Yet Melted in the 'Bunawan' Category.